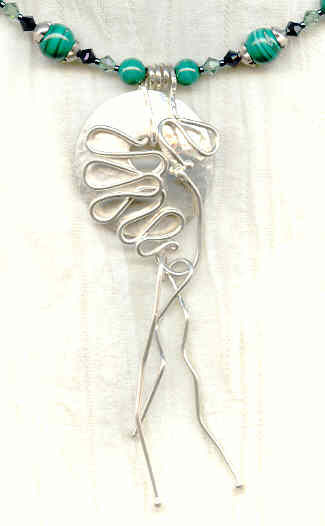 The slightly convex sterling silver pendant is 1-1/4" in diameter, and has a spiral bail and surface embellishment of heavy sterling wire soldered to it. Along with the wire dangles, it hangs a total of 3-3/4" below the strand. The 16-1/4" strand features 8mm, 6mm and 4mm malachite beads, sterling silver bead caps, and 4mm Swarovski crystal bicone beads in jet black and soft, misty erinite green. The clasp is a silver plate hook set. Dreamy and romantic, it's from SPARKLE PLENTY, of course. 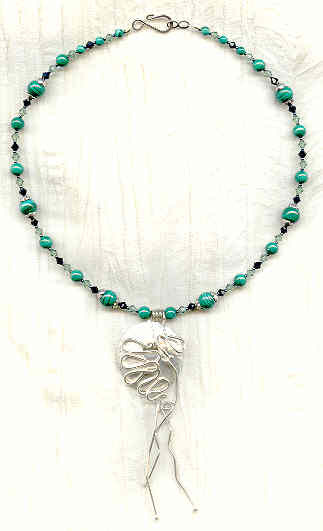 The smooth opaque glass stones set in the vintage silver-tone filigree pendant are on the green side of turquoise. This long pendant necklace has a lot of love to give, and is just as likely to inspire some in return!